Today's supermarket "hybrids", have been developed for their long shelf-life, but classic "Heirloom" tomato varieties are picked for their superior flavors. 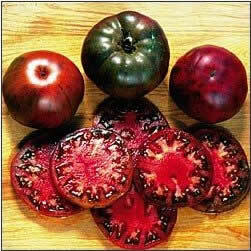 There are hundreds of varieties of Heirloom tomatoes that gardeners around the world have carefully selected and preserved for generations, so you’ll find much more than just red tomatoes – you’ll discover green, yellow, orange, purple, and even black ones, as shown in Figure 1, (many say these tastes best). Some will be sweet, some spicy and others smokey; they’ll range in size from tiny cherries to giant fruit that weigh over two pounds. How Do You Pick The Right Heirloom Tomato? With so many heirloom varieties, nurseries and chain stores are only able to carry a limited selection, so small gardeners have been stuck with just a few options. Recently though, specialty farms have begun shipping sturdy young plants direct to gardeners. Some even offer themed collections made up of popular varieties, so picking which plants to grow is easy. You can find these collections and a huge selection of individual varieties through websites. They offer a range of packs, each with a different theme, including: beefsteak tomatoes container growers, high yeild plants, huge fruit plants, Italian paste & sauce, weather tolerant, cherry tomatoes, and more. Once you’ve got the right plants for you, it’s just a matter of raising them. Thankfully, heirlooms are hardy (they have to be to have lasted so long), and they’re easy to grow. Most heirlooms are "indeterminate", which means they grow like a vine, and they’ll produce fruit all season long – until the first frost. "Determinate" plants are more like a bush, and they typically produce all their tomatoes in one batch. Depending on which you’ve selected, they’ll require slightly different care. Basically though, with sun, water, a little fertilizer and pruning, you’ll be enjoying delicious tomatoes all summer long. Many tomato growers share their knowledge on the Internet, and this increased communication has helped the Heirloom tomato community expand significantly. Many web sites feature growing hints and tips as well as discussion forums. Most garden centers and nurseries have staff who are quite knowledgeable - search them out and find a new friend!